Give your best buddy a hearty choice of meals with the Pedigree Chopped Ground Dinner Variety Pack With Chicken, Filet Mignon & Beef Wet Dog Food. 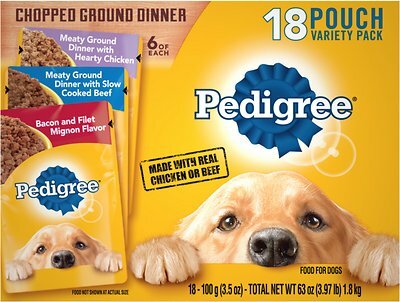 Made with a ground texture that will make his mouth water, this meaty feast contains optimal levels of oils and minerals to promote healthy skin and a glistening coat. 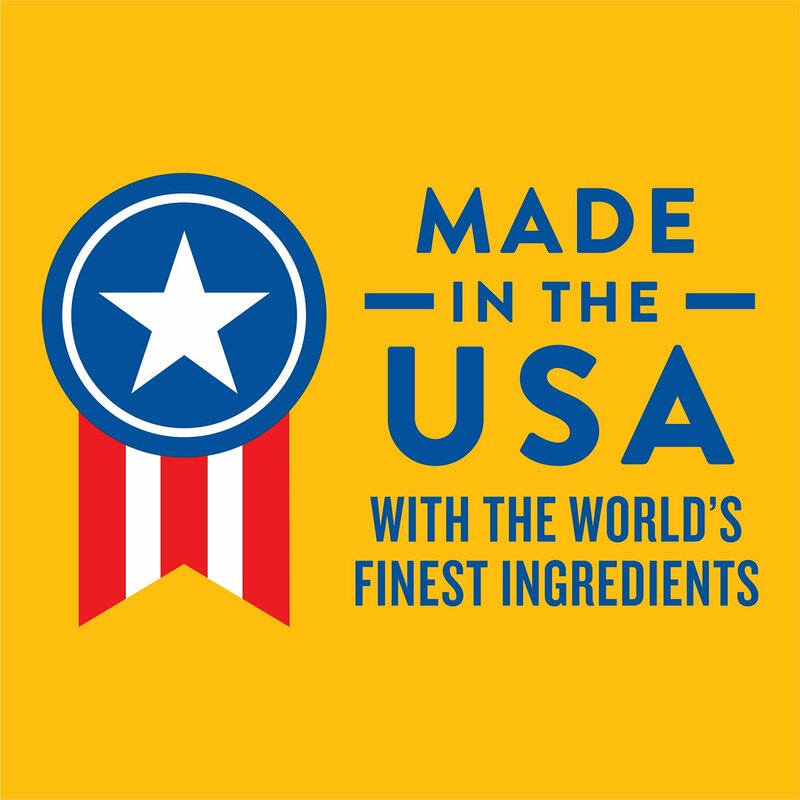 The balanced recipe is also highly digestible, which means your dog can easily absorb all those essential nutrients—so you can feel confident that he’s getting the most out of every meal. But all he’ll really care about is the irresistible flavor, which is sure to get a tail wag at every mealtime. 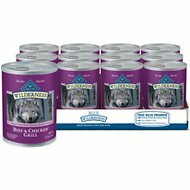 Variety pack features a hearty chopped texture with an irresistible choice of flavors. Hearty Chicken: Chicken By-Product, Chicken, Sufficient Water For Processing, Meat By-Products, Pork Liver, Sodium Tripolyphosphate, Minerals (Potassium Chloride, Magnesium Proteinate, Zinc Sulfate, Copper Proteinate, Manganese Sulfate, Copper Sulfate), Carrageenan, Guar Gum, Dried Yam, Added Color, Xanthan Gum, Vitamins (Choline Chloride, Vitamine E Supplement, Biotin, D-Calcium Pantothenate, Thiamine Monoitrate, Vitamin A Supplement, Vitamin D3 Supplement), Natural Flavors, Dextrose, L-Cysteine Hydrochloride, D-Xylose, Glycine. Slow Cooked Beef: Chicken By-Product, Sufficient Water For Processing, Chicken, Meat By-Products, Pork Liver, Beef, Carrageenan, Minerals (Potassium Chloride, Magnesium Proteinate, Zinc Sulfate, Copper Proteinate, Manganese Sulfate, Copper Sulfate), Added Color , Guar Gum, Natural Smoke Flavor, Xanthan Gum, Vitamins (Choline Chloride, Vitamine E Supplement, Biotin, D-Calcium Pantothenate, Thiamine Monoitrate, Vitamin A Supplement, Vitamin D3 Supplement), Dextrose, L-Cysteine Hydrochloride, D-Xylose, Glycine. Bacon & Filet Mignon: Chicken By-Product, Sufficient Water For Processing, Chicken, Meat By-Products, Pork Liver, Bacon, Beef, Sodium Tripolyphosphate, Minerals (Potassium Chloride, Magnesium Proteinate, Zinc Sulfate, Copper Proteinate, Manganese Sulfate, Copper Sulfate), Added Color, Carrageenan, Guar Gum, Natural Filet Mignon Flavor, Xanthan Gum, Vitamins (Choline Chloride, Vitamine E Supplement, Biotin, D-Calcium Pantothenate, Thiamine Monoitrate, Vitamin A Supplement, Vitamin D3 Supplement), Dextrose, L-Cysteine Hydrochloride, Dried Yam, D-Xylose, Glycine. 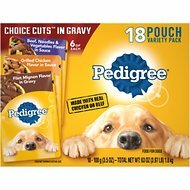 Feed 3 pouches daily per 10 lbs of Adult dog. An individual dog's needs may differ. Refrigerate after opening (up to 3 days). Serve at room temperature. My pepper girl (black lab/plott hound) LOVES pedigree wet dog food out of all the other, even pricier/healthier alternatives, available. She gets a scoop of a dry food with 2 packs mixed in for each meal. The package is easy to tear open; no fuss, no muss. No more opening those larger cans of wet food, only to use half of it, refrigerating the rest for use later!! Hi my dogs go crazy when they smell this as soon as I open pouch. No matter where they are in house I can be sure as soon as I open pouch they are right behind me. FINALLY, OUR DOG LIKES IT! 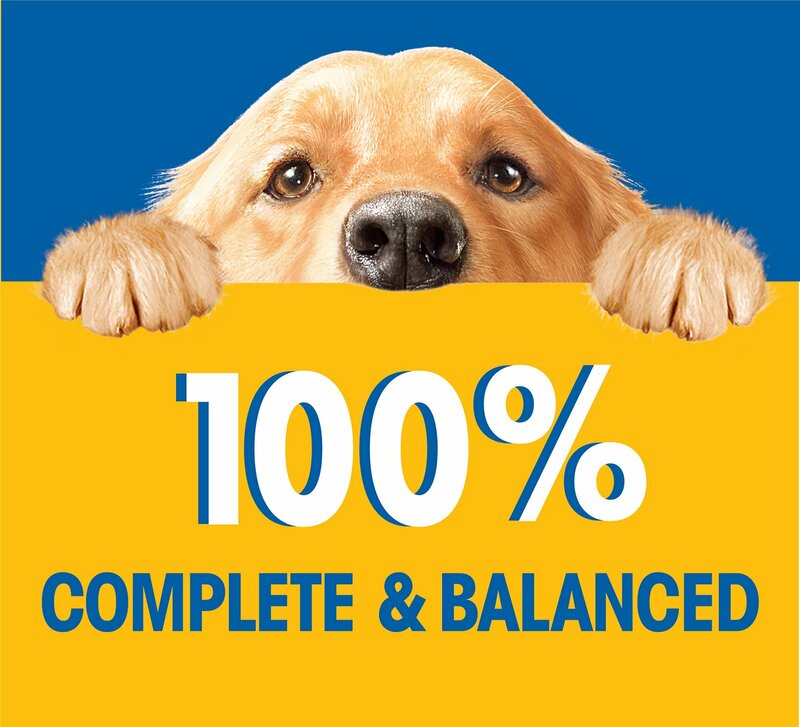 I have been buying various brands of dog food, some quite expensive. All too many times, our little guy rejected them. I ended up tossing the attempted meal and giving away the rest of the case. 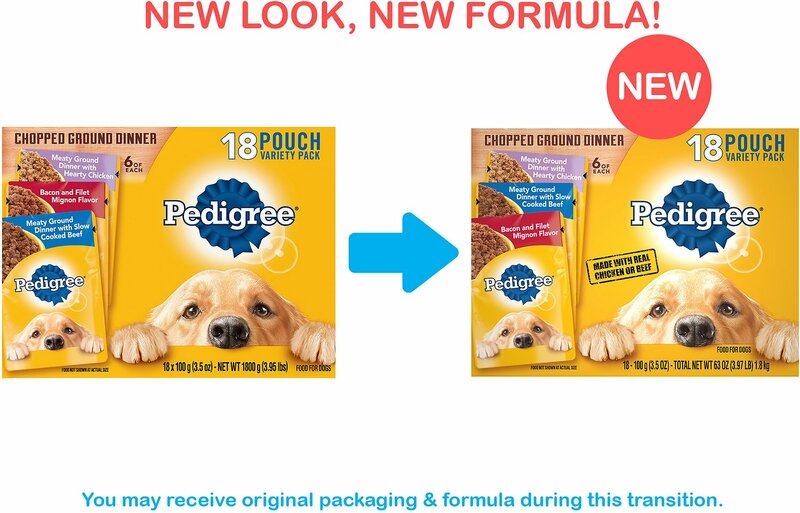 We tried these Pedigree packs and , alas, he likes them! What was even more attractive was the BOGO deal offered by Chewy. Now the lttle guy is eating his meals and I have actually saved money. This turned out to be a great purchase and Chewy's quick delivery made it even better. 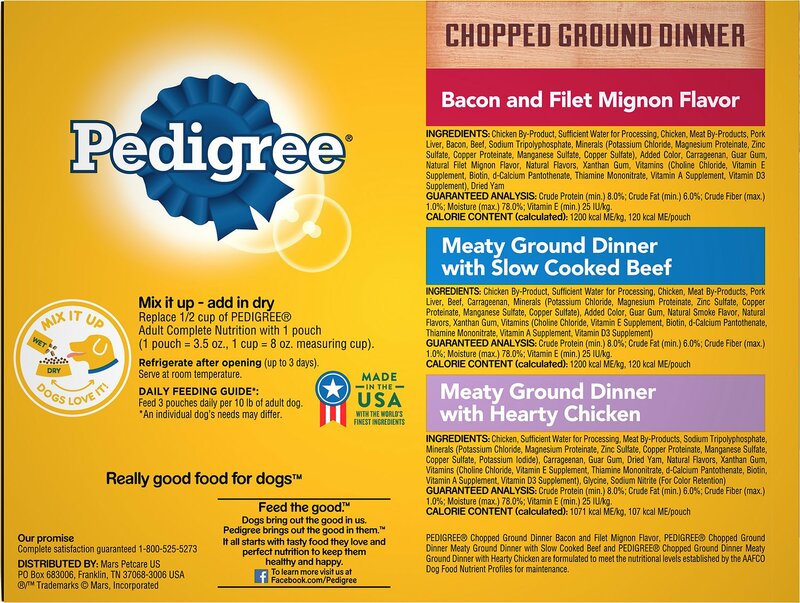 Pedigree is a nutritional dog food. My Chole has been eating it for 6 years now. She prefers the chicken and turkey. Many stores in my area are not carrying this product any longer.. I like it because the small envelope is easy to throw away rather than a can. how easy it was to order and have it arrive at my door. I ordered this to try disguise medicine from my seniors. It worked well. Some of it I used to mix with their dry food instead of the chicken or hamburger soup I make for them.It was not as well received as the soup. It ,however, is a quality product that can be kept on hand when I don't get out for meat. My dog hates chopped food she turns her nose up at it. So I won't be buying it anymore. .
My dog loves Pedigree and this is the perfect potion. She really does. It never lasts more than 10 seconds and she's begging for more.